Note: We are closed on Monday, April 22nd! Prevent ordering the wrong product! 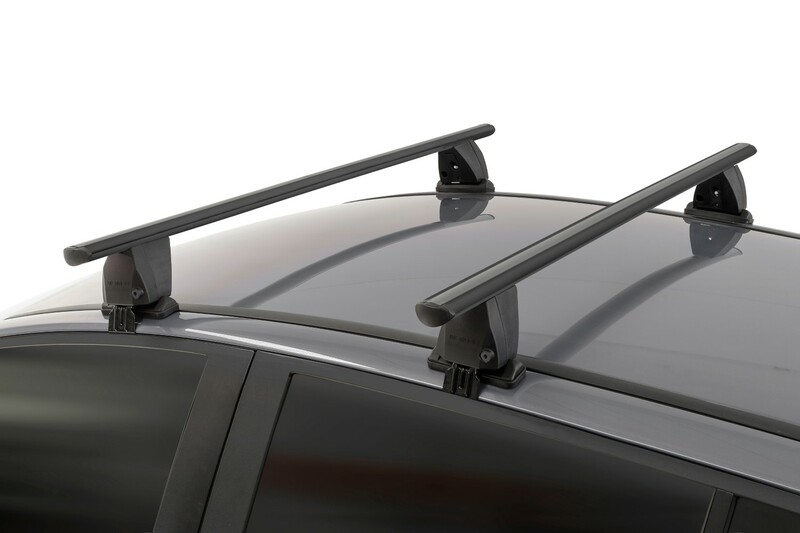 This roof rack set of the brand Menabo consists of two roof racks and is suitable for your Mini One - Cooper (F56 - Mk III). The Delta product line is the successor of the Menabo Tema. The Delta roof carrier was improved in various points compared to the Tema: more robust design, more user-friendly mounting and reduced wind noise thanks to smoothly finished inner surfaces of the mounting feet. The crossbars are made of aluminum and therefore light in weight. Ideal for transporting your roof box, ski carrier, bike carrier etc. Car Parts Expert supplies roof racks of different brands and in different price categories. For more information click here. *) Also check the maximum admissible roof load of your car. The shipping costs depend on the destination country and the weight and size of the parcel. The shipping costs are separately shown during the ordering process, before you pay. For an overview of the shipping costs per country, click here. Different shipping costs apply to sidebars, click here for the overview. Are you not satisfied with your purchase? Please let us know immediately by email at info@carparts-expert.com. You can return your order within 14 days after receipt. Returned articles must be complete and - as far as reasonably possible - in the original factory condition and packaging. For more information about returning shipments, click here. The delivery time of an order consists of two parts. - The time needed to prepare the product for shipping. This is determined by the moment the order is placed and whether the product is available from stock. - The shipping time needed to have it delivered by our shipping partner. If the product is in stock and if you place your order before 15:00, the parcel will be shipped on the same working day. Orders placed during the weekend or on holidays will be shipped the next working day. For an overview of the delivery times per country, click here. - Available from stock: the product is in stock, if you place your order before 15:00 it will be shipped on the same working day. - 1-2 working days: the product is not in stock, we will ship it out to you in 1-2 working days. - 3-5 working days: the product is not in stock, we will ship it out to you in 3-5 working days. - 5-7 working days: the product is not in stock, we will ship it out to you in 5-7 working days. - 7-10 working days: the product is not in stock, we will ship it out to you in 7-10 working days. - 10-15 working days: the product is not in stock, we will ship it out to you in 10-15 working days. If you have ordered more products at the same time, these are always sent together. Thus the product with the longest additional delivery time determines the moment that your entire order can be shipped out. Car Parts Expert delivers its parcels with DHL or EMS. Once your order has left our warehouse, you will receive an email at same evening with all details of your order, including a link to the website of our shipping partner. Here you can easily track your parcel and the time frame is specified in which the package will be offered.